,/oi* tmmm f/**e &bettia /eyttitmre. words. There are no words. dilemma. How does one talk? And how does one NOT talk? home, in Israel and worldwide. Looking to their brethren for hope and heartfelt antcem. the needs of all our residents. the pride of being a Jew. Crafts Classes And Much More! knees, and the mouth becomes parched. ed myself. I said why I was calling. I explained the need. pressure. Where did I go wrong?" going. I don't feel I have any obligation to other Jews. worker for its senior adult program. The solicitee at the other end of the line is unconvinced. skin-crawling refrain, "No." The volunteer panics. his ear. "Did I hear correctly?" he moans to himself. "What? No pledge!" he wails. Quick. Another approach. even have to make this pitch? thwhile causes ... so many needs. Who else can we turn to? send in the $5 as his pledge. its teachers a deserved and needed raise. survival worth at least the cost of lunch? Leadership Group of the Atlanta, GA Federation. Ruth GeMor. Coordinator; 8358 W Oakland Park Blvd.. Fort Lauderdale. FL 33121 Phone (305) 7488400.
reflect the opinion of the Jewish Federation of Greater Fort Lauderdale. making itself seen and heard. spent several hours with Dr.
theistic basis, in our view. Judaism to the mystery of life? to the mezuzah at his doorpost. poor people to collect grain. Boaz and gave birth to a son. father of David" (Ruth IV:17). might well die of old age! Then there i8 "one sided"
fairs. This idea has its merits. tral American sugar producing countries. tisan caucus group composed of members of the U.S.
ly by the United States Holocaust Memorial Council. tion at its spring meeting in Washington, D.C.
ment to end the conflict. we can do on our own? square one and the status quo? mon wisdom" is not correct. woe unto you, King Hussein. discuss one of the nation's most important concerns AIDS. Israel and around the world. ing Place, all located on the W.
tein, John Streng, Barbara K.
ecutive Committee meeting. 10:30 a.m.
June 8 Women's Division Nightline Senes. Division meeting. 6:15 p.m. At Federation. tured but participating in the 'mini-mission' is Sylvia Goldberg. here but yet it is forever. world might be a better place. you are wrong, it is not all bull. you can see what life is about. experience I will never forget. this is just another step in that direction." planned it, step after step. ly, he saw that nobody cared. than the battle of France. hath. He knew he must resist. who suffers may come to us. not, it will be destroyed." ference to life and death. fessor Wiesel began to speak. day, too, I whisper to you. you, I thank you very much." what else we should do. other experts in arthritis care. family doctor about our programs. Come stay with us for six days. Saturday, June 6 at Beth Am. May 30 at Beth Torah. in every book he pens. that's for the Soviet Jew ..
the work he's yet to do. B'nai Mitzvah at Kol Ami. day 8 p.m.. Saturday 9 a.m., 5 p.m. Rabbi Avaroa Draxin. Cantor Irvin Ball. TAMARAC JEWISH CENTER (721-7660). 9101 NW 57th St.. Tamarac, 33321.
daily 8 a_m. ; Sabbath 8 p.m., Sabbath morning 8:45 a.m. Rabbi Avraham Kapnek. TEMPLE BETH ISRAEL (742-4040), 7100 W. Oakland Park Blvd.. Sunrise. 33313. Saturday 8:46 a.m., 7:45 p.m. Rabbi Howard A. Addiaon. Cantor Maurice A. Neu. Blvd., Deerfleld Beach, 33441. Services: Sunday through Friday 8:30 a.m., 5 p.m.
Joseph Langner, Cantor Shabtal Ackerman. Services: Friday 8 p.m. Cantor Jehudah Heilbraun. TEMPLE SHA'ARAY TZEDEK 741-0295), 4099 Pine Island Rd.. Sunrise, 33321. 8:45 a.m. Rabbi Israel Halpem. Friday at 6 p.m., Saturday at 8 a.m. Charles B. Fyier, President. 8 a.m., 7 p.m., Saturday 8:45 a.m., 7 p.m.
Tuesdays 8 p.m. Rabbi Aron Lieberman. Deerfield Beach, 33441. Services: Sunday through Friday 8 a.m. and sundown. Saturday 8:46 a.m. and sundown. Joseph M. Reiner. President. bi Chaim Schneider. Congregation president: Herman Fleischer. TEMPLE BET TIKVAH (471-8088). 8890 W. Oakland Park Blvd.. Sunnse, 33321. Services: Friday 8 p.m. Cantor Richard Brown. Menorah Chapels, 2306 W. rffllsboro Blvd., Deerfield Beach, 33441, Friday 8 p.m. Rabbi Nathan H. Fish. Cantor Msrris Lerinaon. TEMPLE EMANU-EL (731-2310). 3246 W. Oakland Park Blvd.. Lauderdale Lakes. Bat Mitzvah Rabbi Jeffrey Ballon. Cantor Rita Share. Creek Parkway. Rabbi Brace 8. Warahal. Cantor Barbara Roberts. evenings at 8 p.m. RahM Lewis Littman. story behind the sculpture to an interested visitor. entertained a crowd in the gym. a load of hot dogs. contributed generously to Israel 'S9 celebration. Member* of oar Ammciatiea are technically trained and relifioualy authonied. entertained crowds of other kids during the afternoon. at the time of death. for wise consumers from Menorah. Making a difficult time easier. 17 mg. "tar". 1.3 mg. nicotine, av. per cigarette by FTC meihod. prepared for you to sign. $30,000 income tax deduct in. costs far exceed the benefits. gifts versus not making them. more sense under Tax Reform. are lost as tax deductions. guidance of their teacher Mr.
culture and the land of Israel. kosher go hand i n hand. ohanc* with our redemption policy Cop*s *? to head up each subcommittee. the school peaked to 210. L'Chaim AZA in Boca Raton. at Spanish River High School. Day School director, and Sol Schulman. S-year-oid Steven Zeiger, son of Mr. and Mrs.
unique delights, all made to the highest standards of Kashruth. coast to coast-ask your grocer for Empire Quality! 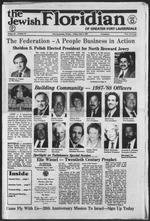 'Countdown '87 Reaching Out to North Broward Jewry! One. .that's where it starts. With one. One person in need. and in its 750,000 Arab citizens. General of the Foreign Ministry, Yossi Beilin, said. ners in small towns in Italy, France and Greece. for more and more people. food or clothing or housing. help to find each other. THE WMS INCH FN FMMUES! Liveliest Resort For The Entire Family! more and more people need. need wherever they may be. life and a Jewish life! away Because we know nothing's better for your body. graduates who have completed / APp^y fifryut. U.S. phase: 18 months of science and /PALL IOa? Edna Rindner and Shirley Winkelman. Purim by the children of the Hebrew Day School. its position on the issue. highly trained Rabbis as well as the U.S.
we can enjoy only strictly kosher products. ^. the best poultry on the market today. thousands of years continue to provide a superior product today. his service Moty's Car Care. air craft to land craft! Levine. She ought to know. of the month for March. Show and Sale in Soref Hall. public for another five days. Judaica. "The best I've heard"
funny twii\ge in your back. Or eyes that really sting. you need to see a doct i >r. AMI Hospitals in Dade or Broward. sure to get back to you the very next day. At AMI, we want to help you find the right. cluded Crossing the Red "C,"
the success of the "Israel 39"
Dr. B.H. Comb and Dr.
tions, Steven Fayne, Outgoing Treasurer. at the Holiday Inn Plantation. Gladys Daren, Rabbi Robert P.
Rep. Elaine Bloom (DMiami Beach). Hall, 4300 NW 36 St.
tor Rita Shore. At Temple. Temple Kol Ami: 8 p.m.
or Call offer ftM P.M.
per person includes lite dinner. Bldg., 4300 NW 36 St.
Ramat Shalom: 9 a.m.-l p.m.
By US. Gov't. testing method. Now Greatly Reduces Serious Risks to Your Health. Competitive tar level reflects the Jan. '85 FTC Report. Report JAN. '86. BOX Ws: Less than 0.5 mg. "tarT less than 0.05 mg.
nicotine. SOFT PACK WOs FILTER, MENTHOL: 3 mg. 'tar;' 0.3 mg.
nicotine, av. per cigarette by FTC method.